An 18-year-old male presented with a large swelling in the right orbit. This was first noted at the age of 3 years and progressively increased in size since then. There was history of mild pain in the swelling but no bleeding or pus discharge. There were no stigmata of neurofibromatosis or tuberous sclerosis. Examination revealed marked proptosis of the right eye (Fig. 1). There was enlargement of the right orbit and palpebral fissure. The right eye ball was not seen. There was a large cystic mass which was fluctuant. Veins in the right eyelids were prominent. The left eye was, however, normal. Routine hematological investigations revealed no abnormality. Chest X-ray was normal. Plain X-ray of skull showed enlarged bony orbit with soft tissue shadow. 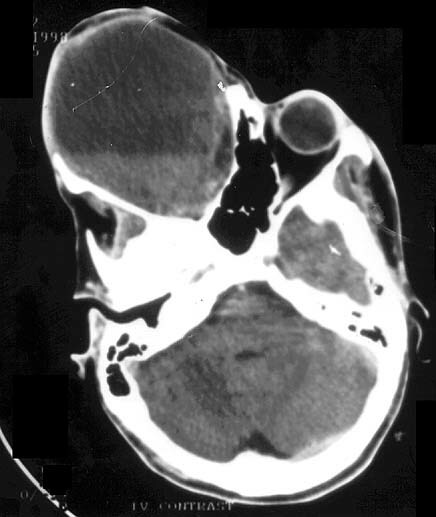 Contrast enhanced CT scan of the head and orbit showed a large cystic mass in the right orbit with debris in the dependent part. There was scalloping and thinning of the orbital bones but no bony destruction or any evidence of calcification was seen (Fig. 2). Optic nerve and globe could not be seen separately. 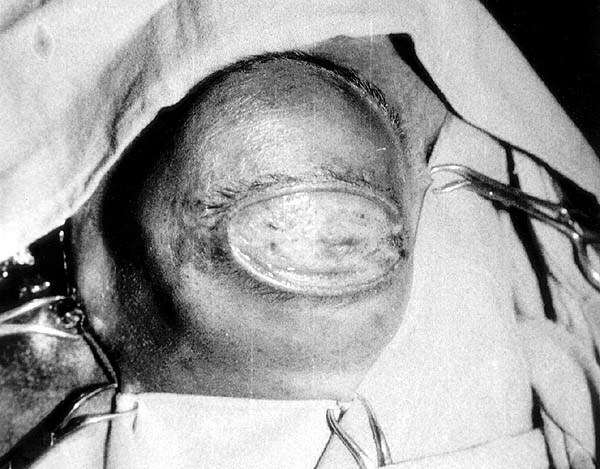 Radiological diagnosis of orbital teratoma was made. The patient was operated through right fronto-orbital approach. There was a large cystic swelling in the right orbit. 300 ml of dark hemorrhagic fluid was aspirated and the mass was excised in toto along with the damaged enphthalmic eyeball which was hardly recognizable.